First Summer Weekend! 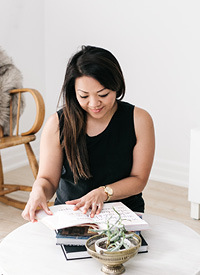 — Love On Sunday Love On Sunday | Interior Styling in Toronto and the GTA. Summer is here! Now that we finally have some warm weather I get to hang out on my balcony (which is almost complete) and I'm happy to say that my outdoor plants are still alive. I was starting to lose hope with all the rain and cold weather but they fought through and are looking much more lively! I made a stop at The Bay on the weekend and I loved their little summer dining display. The colourful plates and foliage has really got me inspired. I haven't worked with many bright colours before so doing up the balcony is going to be tons of fun (you can see a glimpse of it in the top right photo). I'm also looking forward to using the pool in our complex which when you're in it you get a fabulous view of the 2 marilyn towers. Way to get inspired while you're floating in the pool! Summer for me means birthday bbq's, mini-vacays, softball with the cousins and the #bluejays. I'm a big jays fan and they're currently on an 11-game winning streak! What are you excited for this summer?